Festivity has truly began ’round these parts as for the following 10 week-days, i will be showcasing the crème de la crème of Irish beauty products, and brands alike in order to share the love and convey the impeccable products originating from the Emerald Isle, available both here and further a field. The next brand to feature in this series is MONDSS, a personal care company that have got us venturing down avenues we have never before considered ’round these parts- we’re talking perspiring, and the latest form of antiperspirant protection i have been introduced to. Contrary to what you may believe, there are many antiperspirant solutions that do not come in the form of an aerosol can. MONDSS Underarm Wear (£7.91/€9.99) is a highly innovative example of this; in the form of a discreet pad which adheres to the skin, it absorbs and prevents perspiration marks arriving on your attire as a hectic day in the office progresses, all while locking in odour. The main aim of the Underarm Wear is what sparked Jane Mc Ternan, CEO of MONDSS’, initial idea. They have the ability to protect you in ways your typical deodorant can not; preventing yellow marks developing on your favourite white top and avoiding the need to fret about sweat patches developing on your favourite grey t-shirt on the hottest day of the year. Due to their direct skin application, these pads absorb perspiration once it leaves your pores. Ideal for special occasions such as nights out, family occasions or job interviews these disposable patches adhere to the underarm skin without causing a disturbance. Once put in place they remain put all day without budging, pinching or creating any form of discomfort, all while avoiding the white marks on your favourite dark tops, it’s the ideal life, right? While you may not be ready to hang up your deodorant just yet, these under arm pads are the ideal solution to resolving all your nights out fretting about your favourite white dress developing unpleasant underarm stains, and finally ceasing the unwanted white patches on your favourite black top. A real winner. Sigh no more, MONDSS Underarm Wear have got you covered, from nights out to job interviews, create once less stress and opt for this incredibly innovative, breakthrough Irish product keeping your fresh all day long. 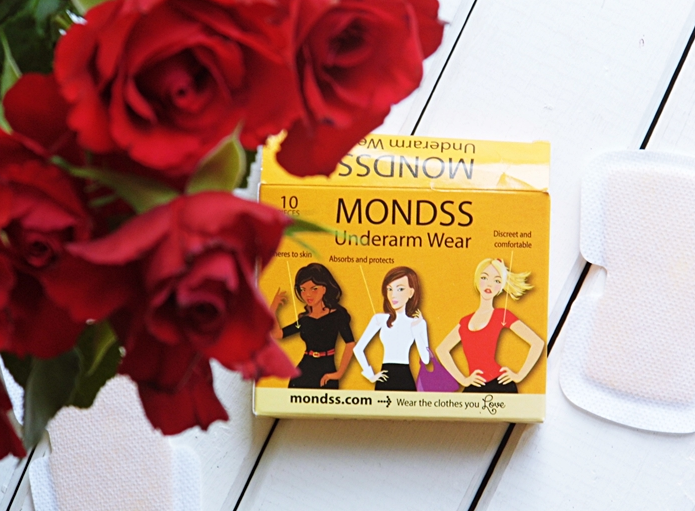 Mondss UnderArm Wear – My Embarrassment Savers!